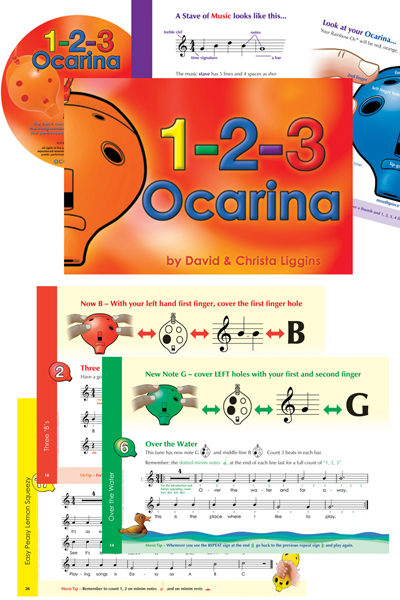 1-2-3 Ocarina can be used as a class music book or a stand-alone, teach-yourself book. Ocarina Notes are introduced one-by-one with lively and effective, step-by-step tuition and colourful, relaxed pages. 31 catchy Songs have been specially written for English 4-hole Ocarinas. They are beautifully simple, with backings to play along with that are both funky and expressive. Details of how to purchase here. This is just right for all our pupils. My year 5’s and 6’s think it’s great. 1-2-3 Ocarina Teacher will help you to teach Ocarina-playing, Music-reading and keep music live in your School.